Available in single or dual-car configuration, both new hoist models offers payloads of 2,000kg a car, and car sizes 1.5m x 3.2m and 1.4m x 3m. The hoists are available with either direct-on-line (DOL) or frequency control (FC) drive via a highly efficient helical gearbox system. A new design with quality, high-strength materials ensures low energy consumption, improved running efficiency and less wear for low total cost of ownership (TCO). Engineered in Sweden and manufactured in China, the new hoist models undergo a series of rigorous safety and quality tests before arrival to market. 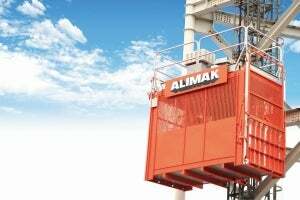 Driven by a high-efficiency helical gearbox, the ALIMAK SC 65/32 and SC 45/30 offers increased hoistpower, smooth operation and energy efficiency, with the safety and usability expected of an Alimak hoist. With the quality and safety that have always been a hallmark of Alimak Hek products since the first hoist entered the market in 1950, the new hoist models will suit all known project demands for vertical access, with reliability, efficiency and a low total cost of ownership. "We are big believers in keeping the TCO, as low as possible," says Pepe Olguin, head of business area construction at Alimak Hek Group. "With the new construction hoist developments, we target to widen our product offerings in the BRIC markets." At our stand, you will also find the latest modular Alimak construction hoist system, the modular Hek medium-range mast climbing work platforms, light-range transport platforms, as well as a new service elevator. Bauma China 2014 will take place from 25 – 28 November in Shanghai, China. Bauma China is the largest and perhaps the most impressive trade fair in Asia. You will find Alimak Hek in the outdoor exhibition area, close to 1# entrance and W2 hall, stand number A14. There, we will be happy to show our new product developments and the advantages they have to offer. We look forward to welcoming you to our stand and the opportunity for further discussions.